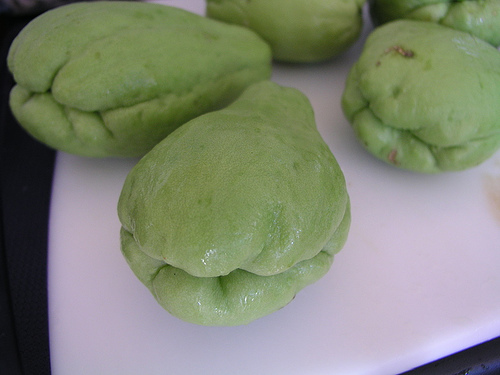 It turns out that across the Americas, there’s this funny vegetable growing that kind of looks like a pear with a scary face on the bottom. In fact, it forms a staple in Costa Rica. But it has as many names as it has locales, e.g. 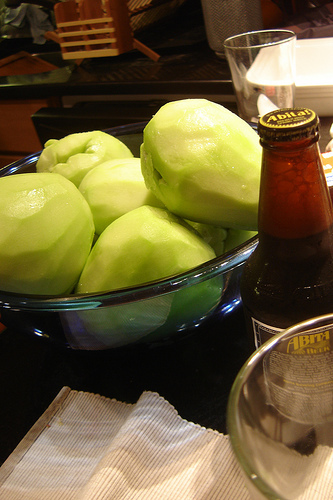 vegetable pear, prickly pear, chayote squash, and in south Louisiana, mirliton, which is what I knew it by originally. My grandmother had a recipe she used to pickle them, and my mother occasionally breaks the recipe out. My dad and I are perhaps the bigger fans: both of us consider them superior to dill pickles, perhaps most of all because of their excellence in roast beef sandwiches. Mom claims to like the pickled onions best, but how can this be true? The pickles are very crisp, and have a sharp, strong, clean taste. Sometimes I cut them very small and use them in salads, leaving out most of the vinegar I would have put in the dressing. They work very well in salads with strawberries and goat cheese. It is also remarkably satisfying to give something you’ve canned as a gift. The best is when your upstairs neighbor also cans, and you can trade little mason jars. Of things I have made, this is among the easier. No stewing required, just overnight soaking. (Full recipe at the bottom.) You can get them at your local bodega, or slightly larger grocery store. Whole Foods will have them too. But watch out, because they can make your skin itself peel. I put the picture behind the link in case you don’t want to see my skin coming off. I should probably wear gloves next time. I’ve said this before. Cut out the cores, which have a thicker texture, and chop them into your favorite pickle shape (I prefer long thin stips, as being the easiest to stay put in sandwiches). 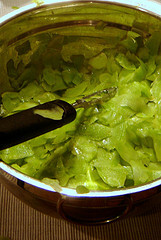 Slice up some onion and celery, as much as you want to have of pickled onion and celery, which is ultimately not that much, and put all of it together in water to soak overnight in the fridge. 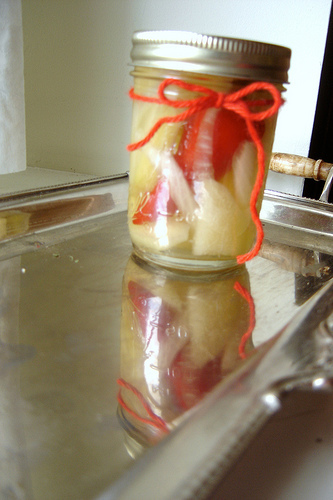 The next day you drain them, dry them, and boil the jars and lids for a few minutes. Then you put a red chili pepper in each jar, and then stuff as many pieces of miriliton, onion, and celery into the jars as possible. This last is quite difficult, because they always shrink, and sometimes you get a jar with so few pickles in it you feel a little gypped. So pack tightly. Here I’m using some purchased half-pint mason jars, which are good for gifts, since sometimes the recipient of homemade non-cucumber pickles looks like they may or may not have the courage to try them. The larger jars are old regular pickle jars, pasta sauce jars, which have been washed, washed, and washed again, and boiled a little extra to get their former smells out of them. (This is just me, because I am picky.) These we keep, or give to known m.pickle-lovers. Now the pickling liquid: vinegar, salt, and sugar/honey, which you boil all together till the salt and sugar are dissolved. I try to use more honey, since I prefer the taste and Hb is an anti-refinement/processing Nazi these days. Now, the original recipe calls for white vinegar, and this is what I usually use, but this time I branched out and added a little fancy sherry vinegar to some, a little white wine to others. You know, it just didn’t taste as good. It tasted more sweet, and I’ve never been fond of sweet pickles. No, white vinegar sounds crazy, but it totally works. I also tend to use far, far more of it than the recipe calls for, so you might want an extra quart or two around. Lastly, you pour the hot liquid into the jars and close them up, and the lids seal themselves perfectly, on account of the heat. They’re ready to eat pretty much after a day. With roast beef! Or just straight from the jar. Sterilize jars and lids in boiling water for five minutes. Peel and slice 6 mirliton, 2 onions, and 3 stalks celery. 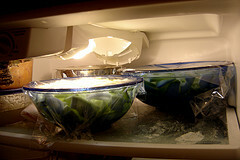 Cover and soak overnight in cold water in refrigerator. Drain off liquid, then pat vegetables dry with paper towels. Boil one quart white vinegar and 1 extra cup with 1/2 cup sugar and 1/4th cup salt. Remove from heat. 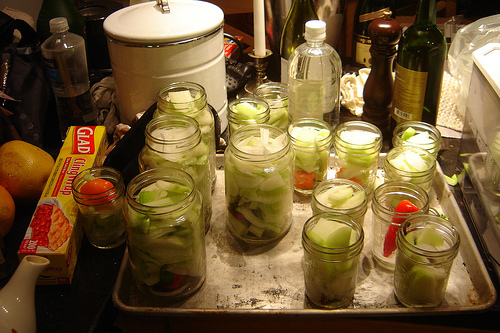 Pack jars with mirliton, celery, onion slices and one red hot pepper. Pour hot vinegar mixture to the fill line and place lids on top. Do not process. Cooling will create a vacuum and the lid will seal by itself! *Ok, actually I did three years ago, and I had forgot about it, because it was such a failure. Cherry jelly failed to thicken. Something went wrong. Maybe next time.